Avatar, "one who descends," refers to one of the Supreme Person's many incarnations or expansions who periodically visit the material world. Krishna Himself, or one of His empowered representatives, comes in every age in order to free His devotees from repeated birth and death and to vanquish the wicked. Avatars either fully or partially possess God's omnipotence, and they act in extraordinary ways to attract the interest of the residents of this world. There are various types of avatars. Krishna expands into three Vishnu forms, purusha-avatars, to create and maintain the universe. He also comes here in His original form, as Krishna, the Supreme Personality of Godhead, or in such forms as Rama, Nrsimha, Varaha, and Kurma to perform uncommon pastimes, or lilas, for which they are known as lila-avatars. In each of the great cosmic ages, yugas, God appears as a yuga-avatar to teach the prescribed religious principles, dharma, of the particular age. He also empowers His representatives—prophets, saints, and messiahs—for this purpose. Such empowered personalities, shakty-avesha avatars, are not God Himself but have the divine ability to influence others to become God conscious. The Supreme Person appears many times, in many places, and in many forms throughout history. He is known by many names in many languages, and teaches religious principles according to time, place, and circumstances. The most recent avatar of Krishna is Chaitanya Mahaprabhu, Who taught that congregational chanting of God's names is the prescribed spiritual practice for the present age. - a general summary, briefly explaining Krishna's various types of avatars and the reasons They appear. - How Krishna is one Person who unlimitedly replicates Himself to accomplish many things. "O brahmanas, the incarnations of the Lord are innumerable, like rivulets flowing from inexhaustible sources of water. " "The incarnations of the Supreme Personality of Godhead appear continuously, like the waves of a river or an ocean. There is no limit to the Lord's incarnations, but they can be perceived only by devotees who are fortunate." "We can conclude that there is no end to the expansions and incarnations of Krishna. Lord Chaitanya described some of them to Sanatana just to give him an idea of how the Lord expands and how He enjoys. These conclusions are confirmed in Srimad-Bhagavatam ( 1.3.26)." "In the Brahma-samhita also it is said indirectly that although there are many incarnations of the Lord, such as Rama, Nrsimha, Varaha, Matsya, Kurma and many others, the Lord Himself sometimes incarnates in person. Lord Krishna and Lord Sri Chaitanya Mahaprabhu are not, therefore, incarnations, but the original source of all other incarnations. . . such incarnations are distinguished by specific extraordinary feats which are impossible to be performed by any living being. That is the general test to identify an incarnation of the Lord, directly and indirectly empowered." 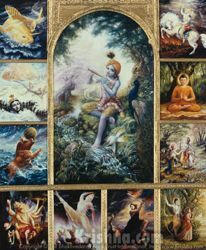 Srimad-Bhagavatam, Canto One, Chapter 3, "Krishna is the Source of All Incarnations"
- Krishna's avatars, listed and described. Is Krishna an avatar of Vishnu?